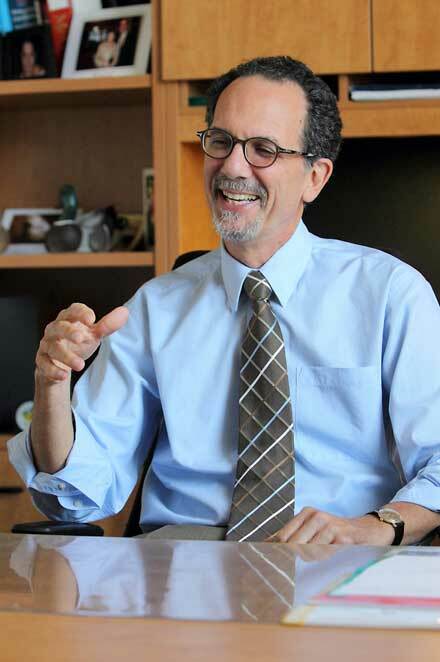 Deputy Provost (Student Life and Learning) Morton Mendelson is starting his last year as the first DP-SLL, a position that was created largely in response to Principal Heather Munroe-Blum’s Task Force on Student Life and Learning. He takes some time to reflect on how things have improved for students and what lies ahead. Tell us a bit about what you do in this job. The idea behind my position was to have someone in the senior administration who represents student issues, so those issues would be considered at the senior table and other issues would be considered with reference to how they affect students and student life. At the time the position was created, the units that serve students in various ways were quite fragmented, so there was a reorganization … and units are now in a better position to co-operate and to integrate their functions. I think the best example of that is Service Point. My office and I don’t address individual student cases or problems; we deal with general cases, student associations and policy issues. If individual students come to my office or contact us about a problem, we make sure to put them in touch with the person who can address that problem. General issues that come up may require a discussion of policy; if so, I will likely become involved. Nonetheless, I do interact with students and meet regularly with the leaders of the University-level student associations. What have you enjoyed most about this job? The greatest part of my job is talking to students, interacting with students and being able to participate in improvements in the University that affect students. I could point to dozens and dozens of improvements. I can’t take personal responsibility for all of them, even all the ones initiated by the units that report to me. But I can take credit for leading SLL, for creating an outstanding executive team that is motivated and eager to improve student life and learning, and for creating a context of co-operation both across the units and between SLL and other units in the University that support our efforts. And that’s been terrific. Why does improving student satisfaction seem to be something of a challenge at large universities? It has taken a long time for people not to explain away or otherwise dismiss data that we get from students about their own experience. But we are finally getting people to pay attention to surveys, such as the NSSE [National Survey of Student Engagement]. We’ve done two things recently to try to address McGill’s poor NSSE ratings in some areas. We’ve put together a work group to highlight issues flagged by our NSSE results so we can collectively agree to address them. Advising is one thing we know we still need to improve, and we have already been doing something about that. Former Dean of Students Jane Everett did a lot of work in promoting advising and set a framework – a foundation – that will enable us to move forward. Now we have to take advantage of that. The second thing we’ve done is establish an academic advising and mentoring advisory board, to be led by Kelly Meighen. The members are all from outside McGill, but deeply committed to the University… and they will help us look at advising and mentoring, draw our attention to shortcomings, and, essentially keep our feet to the fire. But the news from student surveys is not all bad, and the NSSE highlights some of the pluses to the McGill student experience. Students find McGill an academically challenging environment, and we’re happy about that, because we know our students are up to the challenge and this is the kind of place where those with academic talent can flourish. There always seems to be lots to do. There are so many things that we need to do and there aren’t enough resources to do them all. Some things just have to be put on a back burner. I wish we could improve everything at once, but we can’t. One example is the diversity survey that we ran in 2009. It took a lot of time and effort in the end… and that was because we didn’t have the resources. What did the diversity survey show? economic background and so forth. We confirmed suspicions that there is far less economic diversity at McGill than one expects in a university population. Fully three-quarters of our students have at least one parent or guardian who attended university, and across Canada that figure is 40 per cent. So that’s just one indication of how different our students, as a group, are from students in general. This is not to say there aren’t students who come from families who don’t have economic means, but students at McGill, on the whole, come from more privileged backgrounds than is the case elsewhere in Quebec and Canada. We want to broaden our student base, to attract students who come from groups that are under-represented at McGill. And one of those groups is economically disadvantaged students. Another obvious group is Aboriginal students. We need to reach out to communities, so that talented youngsters, who might not otherwise think about attending McGill, or might not even think about a university education, begin to think about those as real possibilities for themselves. The Faculty of Law has been very successful in promoting access, and we need to adopt their approach on a wider scale. We need to create pipelines of students from communities. And we need to remove impediments to attending McGill. That doesn’t mean simply helping students pay for tuition. The impediments include the opportunity costs and the costs of living, books, housing, meals, as well as social barriers. We have to find ways to support students who don’t have the economic means and to help them adjust to an environment that can be very foreign to them and to their families, providing the supports they need to succeed. What do you think we have in store with respect to protests, etc., and the atmosphere on campus for the coming year? I’m enormously upbeat and optimistic, for three good reasons: The first is that one of the important outcomes of last year, what I see as the real silver lining in what, admittedly, was otherwise my most difficult year at McGill in 35 years, was that there was a range of people on campus who found their voice – people who for many years didn’t seem to have a voice. And I think the University is a better place for that, as long as they keep talking and stay engaged. The next reason is that we have about 6,000 new students coming here – students who are excited about being at McGill, who didn’t experience what we all experienced last year and who are bringing their enthusiasm and excitement with them. And the third reason is one of the reasons so many of us really love to be in an academic setting: September 1st, every year, is a clean slate, with optimism about us all achieving our goals, such as getting As in our courses, finishing our research papers, or whatever else we hope to accomplish. It doesn’t always happen, but we’re still optimistic about it – still hopeful – and that’s one of the things I love about being in academics.